Note: most DAWs have a different way to paste. We will update this webpage with more instructions. Check your DAW’s app instructions if a simple ‘tap’ doesn’t work . When your DAW has copy/paste functionality it will work (a.o. Garageband, Auria, Cubasis, Music Studio, Multitrack Daw)!! NOTE: It is best to set you GB advanced settings to ‘run in background’ for faster switch between apps . With this option GB doesn’t have to start up it’s engine every time, which prevents pasteboard issues! There’s no need to do this if everything works smoothly and fast enough for you. 2. Open Garageband, and open new or existing song. 3. Tap your finger on empty field within your song, a ‘paste’ pop-up appears and click paste. A new track will appear with the loop. 4. The loop is 2 bars (stereo mix) and cut to perfection in its own bpm. To repeat the loop at any length, select the loop by tapping on it, then tap again and a dialog will appear with options (choose ‘loop’ to repeat). NB: The ‘copied to GB’ loop’s bpm will follow instantly the bpm of your Garageband project (tempo change). You can also choose to set GB to the proper loop’s bpm first and change it after pasting the loop. This is wise when the bpm of your project is much higher (or lower) than the chosen loop’s bpm. 3. In the pasteboard window that opens select ‘Audiopaste From Pasteboard’. 4. You should see the pasted loop appear on your selected track in Auria. There is a problem with the audiocopy app (it uses Sonoma protocol 2 and has some issues). If you delete this app, Auria will paste as it is supposed to do from the clipboard. 2. Open your Cubasis project. 9. In the medialist the just pasted ‘general pasteboard wav’ with the current time and date should be selected blue. Dubble click on the name and you’ll find it in your track. 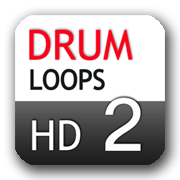 Open Drum loops HD 2 and set a loop to play (red marker appears). Pick a loop and not a fill, because a fill doesn’t loop!! 1. always check your hardware button first: if it’s switched to red, switch it back while playing a loop!! 4. Check the mute button, it should be black.